I hope you are all having a fantastic love day! I thought I'd share how I celebrated mine. As you know Butterflies factor heavily into everything for me they represent change, growth and transformation. This year is a year with many big changes and transformations ahead that are already underway. 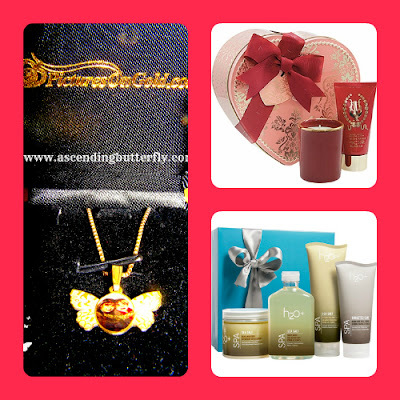 For me, there is no better gift than one that is personal, personalization can go beyond simple engraving, and when I hit upon PicturesOnGold.com Butterfly Pendant it was love at first sight. You can have a picture of your choice put in the center, or your child's thumbprint. I selected a picture of me and mama butterfly for my custom pendant, and when I saw the finished result I knew it would be my first pick as a Valentine's Day Buying Item, and I personally think it would also be fantastic for Mother's Day, Birthday's, Easter Gifts, or a special gift for a special Grad. It's pictured on the left hand side of the collage picture above. My second Valentine's Day swoon item (on the upper right hand side of the collage picture above) is the MOR Cosmetics Blood Orange Bliss Duet, it comes packaged in a Peach colored heart coffret, the duet consists of a nurturing Shea Butter Hand Cream and Blood Orange Scented Soy Wax Petite Candle. The scent is ruby red Italian Blood Oranges infused with soft summer floral notes of Jasmine, Rose and Lily of the Valley resulting in a very fresh, delicious fragrance. My third Valentine's Day swoon item is pictured on the lower right hand side of the collage above and it's the H2O Purifying Sea Salt Body Collection. The best way I can describe the body wash for this spa set is that you feel like you are in the inside of a champagne glass, the body wash lathers so well and it's so bubbly in a tingling and refreshing way that it feels sort of like the bubbles of a champagne glass! This set also helps to restore skin's mouisture balance and it feels super rich and indulgent. I began using H2O years ago when I discovered them in my local Bed, Bath and Beyond. In fact a lot of friends and family know I'm obsessed with their products and I get their kits often as gifts. I love their footcare sets as well. Valentine's Day is a day where we get to tell those we love just how much we appreciate them and vice-versa. I love personalized gifts and think that PicturesOnGold.com offerings of personal photo's on Gold or Silver Jewelry is such an amazing gift idea, and not just for Valentine's Day, but for any gift giving occasion! While Pictures on Gold was new to me, MOR and H2O+ definitely weren't as I've been using their products for a long time now. MOR products have wonderful scents and the most gorgeous packaging, and H2O+ products are also wonderfully scented and equally good for the skin, both of them feel like an indulgent spa day in the comfort of your own home! Didn't get what you wanted this year? Our gift picks above are also a great way to say I Love You to YOU! So check them out for yourself as well as using them as gift ideas to give others. How was your Valentine's Day Butterfly, Did Cupid Surprise You with something fantastic this year? Do Tell, leave us a comment and let us know! FTC Disclosure: No monetary compensation has been received to share our product reviews. All opinions are 100% my own. Pictures on Gold and H2O+ provided samples for editorial consideration, please note the Blood Orange Bliss Duet Kit by MOR Cosmetics was a prize that I won in a competition that they sponsored, I had NO obligation to share about it, I chose to do so because I truly love the products. what a lovely collection,not just for valentines day but they fit the bill for any occasion. Happy Valentine's Day to all !! And I definitely agree these gifts could all work for any gift giving occasion or as amazing hostess gifts too!